Demystifying the key ideas of the world's greatest philosophers, and exploring all of the most important branches of thought including philosophy of science, philosophy of religion and feminist philosophy in a uniquely visual way, this book is the perfect introduction to the hist... read full description below. Demystifying the key ideas of the world's greatest philosophers, and exploring all of the most important branches of thought including philosophy of science, philosophy of religion and feminist philosophy in a uniquely visual way, this book is the perfect introduction to the history of philosophy. A clear and accessible guide to philosophy, How Philosophy Works combines bold infographics and jargon-free text to demystify fundamental concepts. 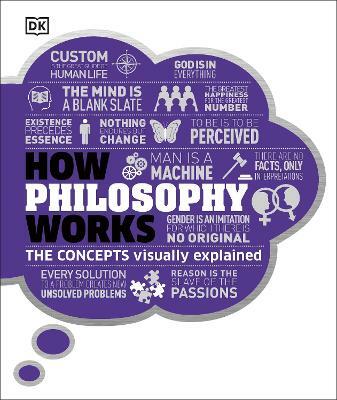 Covering everything from ethics to epistemology and phenomenology, the book presents the ideas and theories of key philosophical traditions and philosophers - from Plato and Socrates to Nietzsche and Wittgenstein via Kant - in a novel, easy-to-understand way. Its infographics will help you to understand the elements of philosophy on a conceptual level and, by tackling life's big questions , it will help you to look at the world in an entirely new way. With its unique graphic approach and clear, authoritative text, How Philosophy Works is the perfect introduction to philosophy, and the ideal companion to DK's The Philosophy Book in the Big Ideas series.